Saginaw Valley State University (SVSU) (commonly referred to as SVSU, SV, or Saginaw Valley) is a public university located in University Center, Michigan. It was founded in 1963 as Saginaw Valley College. It is located on 748 acres approximately 6 miles from downtown Saginaw in Kochville Township, Saginaw County. It is also only 8.5 miles from Bay City and 20 miles from Midland. It is the youngest of Michigan's 15 public colleges and universities. SVSU offers over 100 academic programs at the undergraduate and graduate levels with approximately 10,000 students at its main campus in University Center. SVSU offers strong programs of study in its five colleges. Among the more popular are teaching, nursing, engineering, business, the health professions, and traditional liberal arts programs like the performing and visual arts, as well as degree programs like criminal justice, psychology and professional technical writing. Higher education in the Saginaw Valley region dates back to the founding of Bay City Junior College in 1922. Though the junior college was replaced by Delta College in 1961, the area still lacked a four-year baccalaureate institution. Saginaw Valley College was founded as a private institution in November 1963, and became a state-supported institution in 1965. The name changed to Saginaw Valley State College in 1974 and again to Saginaw Valley State University in 1987. In 1955, civic leaders in the Saginaw Valley region met to discuss prospects for a local institution of higher education. The next year, a committee of 300 recommended a two-year community college which would expand to a four-year college. The two-year college, Delta, was approved by voters in 1958 and opened in 1961. Articles of incorporation for what would become Saginaw Valley College (originally called Delta Senior University) were drawn up in 1963, and the state granted a charter to SVC as a private, four-year liberal arts institution. Dr. Samuel D. Marble, the president of Delta College, was appointed president of SVC in 1964. After holding both presidencies for four months, he resigned from Delta. The first class of 119 students completed two years at Delta and transferred to SVC. The first commencement ceremony was held in 1966 at a Midland church for a graduating class of ten. A site for a permanent SVC campus (the college was operating out of Delta's basement) was chosen in Kochville Township in 1966 and classes were moved to a building on that site the next year. Ground was broken for what would become Wickes Hall in the late summer. 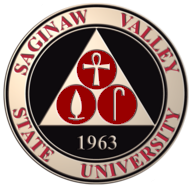 Saginaw Valley College received full accreditation by the North Central Association in April 1970. The college's athletic teams were named the Redbirds, shortly thereafter changed to Cardinals after two coaches spotted a kitchen decoration with a cardinal on it at a golf tournament in Kentucky. In 1972, the Cardinals became a charter member of the Great Lakes Intercollegiate Athletic Conference, and in 1974 Frank "Muddy" Waters was hired as the college's first football coach. The name changed to Saginaw Valley State College in 1974. That same year, Samuel D. Marble, the college's president who had also served in that role at Delta College, submitted his resignation. Marble had also served as president of Wilmington College in Ohio. He would be named president emeritus and is honored with a lecture hall named in his honor in Wickes Hall. In November 1974, Jack M. Ryder became president of the college. A report by the Michigan Efficiency Task Force in 1977 recommended to then-Governor William G. Milliken that SVSC and Delta could be run more efficiently if they were combined, an idea which gained no traction. In 1980 the Higher Learning Commission/North Central Association continued this accreditation and granted accreditation at the master's degree level. Both accreditations have been retained continuously since the original accreditation. Also in 1980, two Japanese students attended SVSC for two weeks, beginning what is now a flourishing international student enrollment. A fire in 1985 destroyed financial records, registration files, and other important records. The college became home to the works of the noted sculptor Marshall M. Fredericks in June 1987. On November 5, 1987, SVSC became Saginaw Valley State University. Dr. Jack Ryder resigned as president in 1989 and Eric R. Gilbertson succeeded him. An off-campus location was opened in Cass City in 1991. In 2000, George W. Bush visited the Ryder Center days before the election where he would be elected President of the United States. The annual Battle of the Valleys, a fundraising competition against rival Grand Valley State University, was established in 2003. In 2009, SVSU alumnus Tony Ceccacci was the lead flight director for STS-125, a mission to repair the Hubble Space Telescope, and an SVSU pennant was sent to space on board the Space Shuttle Atlantis. The pennant is currently on display in Pioneer Hall. On June 18, 2013, President Gilbertson announced his intention to retire when the university's board of control finds his replacement. Ming Chuan University, the first Asian university to be accredited in the United States, opened their Michigan Campus in Gilbertson Hall in 2014. SVSU was selected by the Carnegie Foundation for the Advancement of Teaching to receive its 2015 Community Engagement Classification. To be selected, institutions provide descriptions and examples of institutionalized practices of community engagement that showed alignment among mission, culture, leadership, resources and practices. The designation is in effect for 10 years. In 2013, SVSU celebrated its 50th anniversary with a gala banquet on November 9 and various events throughout the year, including an economic summit on October 25. The university also launched a fundraising campaign entitled "Talent. Opportunity. Promise." with the goal of raising $25 million. Dr. Samuel Davey Marble served as president of SVC from March 23, 1964 to January 14, 1974. He had been the first president of Delta College, from 1958 to 1964. The lecture hall in Wickes Hall was named in his honor, the Gladys and Samuel Marble Graduate Business Scholarship Fund was established in 1997, and the Samuel Marble Memorial Scholarship was established in 1990 to be awarded to a transfer student from Delta. Dr. Jack McBride Ryder served as president of SVSC/SVSU from November 1, 1974 to June 30, 1989. He initiated the successful construction of Brown Hall, the Zahnow Library, the science building, and the Ryder Center. He was also instrumental in raising private gifts for the construction of Pioneer Hall, the Arbury Fine Arts Center, the Marshall M. Fredericks Sculpture Museum, and Wickes Stadium. Due to his leadership, SVSC, Grand Valley State College, Ferris State College, and Lake Superior State College were all elevated to universities by legislation signed on November 4, 1987. Dr. Ryder was named a president emeritus of the University on December 13, 1991. Dr. Eric R. Gilbertson was inaugurated as president of SVSU on August 29, 1989, and served as the longest-tenured in SVSU's history. During his tenure, the university's endowment has increased twenty-fold and the campus physical plant has tripled in size. Enrollment nearly doubled during his tenure. Gilbertson is a former president of Johnson State College in Vermont and was the executive assistant to the president of Ohio State University as well as legal counsel to the Ohio Board of Regents. Dr. Gilbertson announced his intention to retire in 2013 upon the appointment of his successor. On February 10, 2014, Dr. Donald Bachand, the university's provost and academic vice president, was named SVSU's fourth president. He officially took office February 17 and was formally installed June 22. Saginaw Valley State University was accredited by the Higher Learning Commission of the North Central Association as a baccalaureate degree granting institution in 1970. In 1980 the HLC/NCA continued this accreditation and granted accreditation at the master's degree level. Both accreditations have been retained continuously since the original accreditation. SVSU also has ten programs that have been awarded specialized accreditations, including being selected by the Carnegie Foundation for the Advancement of Teaching to receive its 2015 Community Engagement Classification, marking SVSU as a university that is exceptionally engaged with the community it serves. The College of Arts and Behavioral Sciences is the oldest of the university's five colleges. Dr. Marc Peretz is the dean of the college. The James V. Finkbeiner Endowed Chair of Ethics is held by Dr. Peter Rose-Berry. In addition to the number of undergraduate programs, graduate programs are offered in administrative science, and communication and digital media. Scott L. Carmona College of Business and Management is accredited by the Association to Advance Collegiate Schools of Business (AACSB), the premier standard of achievement for business schools. Less than 5% of all schools of business worldwide are AACSB accredited. Named after Scott L. Carmona, a 1981 alumnus, and owner of Sunrise National Distributors Inc., a distributor of automotive afterparts in Bay City, the college is undergoing a 38,500 sq. ft. expansion that is expected to open in 2020. The dean of the college is Dr. Anthony Bowrin. The Harvey Randall Wickes Endowed Chair in International Business is Dr. Joseph Ofori-Dankwa. SVSU offers teacher education programs, advanced educator learning programs as well as certification renewal and endorsements. The College of Education offers undergraduate teacher certification programs in early childhood education, elementary education, secondary education and special education. Post-baccalaureate teacher certification programs are offered for elementary and secondary education, endorsements and graduate programs in teaching, instructional technology and e-learning, and an M.Ed. in principalship. Named for Crystal M. Lange, the founder of the College of Nursing who served as its dean for 20 years, the College of Health and Human Services offers undergraduate and graduate degrees in health science, kinesiology, nursing, occupational therapy, and social work. The university's Board of Control approved a doctor of nursing practice program in December 2011. Judith P. Ruland is the dean of the college. Frank R. Hall was named to the dean position in April 2015, beginning duties on June 1, 2015. Brown Hall is named for Maurice E. Brown. It houses faculty offices and classrooms. The Melvin J. Zahnow Library houses over 200,000 print volumes and over 400,000 non-print items. The Arbury Fine Arts Center is named for Ned and Dorothy Arbury. It houses classrooms and other facilities for the fine arts, including the Marshall M. Fredericks Sculpture Museum. The Herbert Dow Doan Science Building is named for Herbert Dow Doan, and houses classrooms, faculty offices, teaching labs, research labs, and a Starbucks. Curtiss Hall is named for Charles B. Curtiss, a long-time member of the Board of Control. Groening Commons, the large atrium inside Curtiss Hall, is named for William A. Groening. Pioneer Hall, the home of the College of Science, Engineering and Technology, was completed in 1978 and recently underwent a large renovation. It is "certified green" by the U.S. Green Building Council, the first building in mid-Michigan to be so recognized. Eric R. Gilbertson Hall is home to the College of Education and other classes and departments, including the James A. Barcia Center for Public Policy and Service. Originally named the Regional Education Center, the building was named for the University's third president in 2014. Ming Chuan University's Michigan Campus is located in this building. The Health and Human Services Building is home to the Crystal M. Lange College of Health and Human Services. The building incorporates the largest aqua-thermal heating/cooling system in the state of Michigan to reduce energy costs by over 35%. The Doan Center houses the Marketplace at Doan, the main dining hall, and other student-related activities. It is named for Leland I. Doan. The Ryder Center is the main athletic building on campus and also houses classrooms. It is named for Jack McBride Ryder. The Covenant MedExpress is a $2.6 million clinic open to SVSU students and the public. It is part of a partnership with Covenant Healthcare and has X-ray and lab facilities. The governing authority of the university is the Board of Control, established by the Michigan Constitution and by statute consisting of eight members appointed by the Governor of Michigan for eight-year terms. The university is considered a political subdivision of the state government and, thus, is exempt from federal income tax. The president of the university is elected by the Board of Control, to whom the Board delegates the authority to conduct university business except certain items specified in the Board's bylaws. The president is ex officio a non-voting member of the Board. The president has a staff consisting of the four vice presidents; the deans of the colleges; the Executive Director of Information Technology; the Special Assistant to the President for Diversity Programs; the Special Assistant to the President for International Programs; the Special Assistant to the President for Government Relations; the Executive Assistant to the President/Planning Officer; the University Ombudsman; and the Assistant Vice President for Academic Affairs. The Junior Varsity football program dates to 1974; Varsity football started in 1975, as did the marching band. The school song is "Cardinal Fight", written by Thomas Root. The university has a sister-college exchange relationship with Shikoku University in Tokushima, Japan. ^ "Sortable Table: College and University Endowments, 2013-14 - Fund Raising - The Chronicle of Higher Education". Chronicle.com. 2015-01-29. Retrieved 2015-08-22. ^ a b "Saginaw Valley State University". Svsu.edu. Retrieved 2018-04-10. ^ "Saginaw Valley State University". Retrieved 2017-03-22. ^ "Saginaw Valley State University - [time]". svsu.edu. ^ a b "Michigan Legislature". mi.gov. ^ a b Knake, Lindsay (June 18, 2013). "SVSU President Eric Gilbertson to retire when university finds successor". The Saginaw News/MLive. ^ "SVSU Board of Control Resolution Naming Jack M. Ryder "President Emeritus"" (PDF). Svsu.edu. Retrieved 2016-08-09. ^ Devereaux, Brad (June 22, 2014). "Donald Bachand welcomed as Saginaw Valley State University's 4th president during investiture ceremony". The Saginaw News. ^ "SVSU". Svsu.edu. Retrieved 2015-08-22. ^ "SVSU". Svsu.edu. Retrieved 2016-08-09. ^ "Saginaw Valley State University : College of Health & Human Services". Svsu.edu. Retrieved 2016-08-09. ^ "Saginaw Valley State University : College of Science, Engineering & Technology". Svsu.edu. Retrieved 2016-08-09. ^ "SVSU". Svsu.edu. 2015-04-09. Retrieved 2015-08-22. ^ "2004 SVSU Self-Study: Chapter Three—Mission, Planning, and Governance" (PDF). Apps.svsu.edu. Archived from the original (PDF) on 2013-07-04. Retrieved 2016-08-09. ^ Wolcott, RJ. "Japanese high school students bid sayonara to SVSU after two-week cultural exchange program." Mlive. August 8, 2014. Updated August 9, 2014. Retrieved on July 6, 2015. ^ "Al-Humaidan: Saudi's New Spy Chief From Outside House Of Saud". This page was last edited on 27 January 2019, at 18:15 (UTC).